We’d love your help. 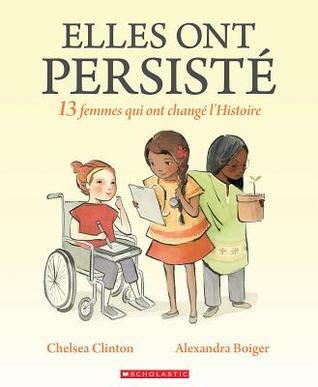 Let us know what’s wrong with this preview of Elles ont persisté by Chelsea Clinton. Le livre idéal pour les avant-gardistes, les féministes en herbe et les jeunes qui sont prèts à transformer le monde! Partout sur la planète, les femmes aspirent à se rendre jusqu'au bout de leurs rèves. Depuis longtemps, elles prennent la parole, se tiennent debout et luttent pour ce qui est juste. Et ce, mème si certains affirment qu'elles devraient plutôt se taire. Qu'ell Le livre idéal pour les avant-gardistes, les féministes en herbe et les jeunes qui sont prèts à transformer le monde! Qu'elles oeuvrent dans le domaine des sciences, des arts, des sports ou de la politique, de nombreuses femmes à travers l'Histoire ont démontré leur détermination à abolir les barrières et à repousser le statu quo. Ces femmes nous ont, entre autres, permis de mieux comprendre notre monde. To ask other readers questions about Elles ont persisté , please sign up. I love this book. I might love it more than the 1st one about American women. It's so important to have a message for girls in the world that says, don't listen to societies 'no'. Listen to who you were meant to be and stand up. Some of these women faced death threats to learn. It's time to get rid of all the glass ceilings. It's time for a female president. It's time women can be anything they are meant to be. The world needs women right now. I didn't know all these women and I'm glad I know of I love this book. I might love it more than the 1st one about American women. It's so important to have a message for girls in the world that says, don't listen to societies 'no'. Listen to who you were meant to be and stand up. Some of these women faced death threats to learn. It's time to get rid of all the glass ceilings. It's time for a female president. It's time women can be anything they are meant to be. The world needs women right now. I didn't know all these women and I'm glad I know of them now. I am someone who lets at times lets 'no' from the outside affect me and sometimes I don't.. I would like to be someone who persists all the time when it is important. I wasn’t aware that Chelsea Clinton had written books. I got to know of this book by chance and though it is for children, I think it is meant for all. Men and women alike and for people in general, more so for men if you ask me. Chelsea speak We need more books such as these. We need books to empower our children – more so girls – they need to know that nothing is impossible and not achievable. There is no such thing as a “man’s world”. And even if there is, it shouldn’t exist because time’s up. Got this in the mail from Uncle Rudy the other day and before we read it, Luxmi said to me: Ruby told me I could read only 1 book but I persisted and read 2! "So speak up, rise up, dream big. These women did that and more. They persisted and so should you." Women have struggled to overcome biased and unjust restrictions globally. 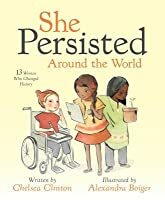 'She Persisted Around the World' captures the journey of thirteen such women that despite being told no went on to achieve significant change for themselves. In doing so, they paved the way for the women that came after them. Told in a concise but empowering tone, this book is for children but should be read by everyone. The c "So speak up, rise up, dream big. These women did that and more. They persisted and so should you." The companion book to 'She Persisted', this book is truly inspiring, touching and just plain awesome. Wether its in the arts, politics, sports, activism or science, the thirteen women featured in this book achieved amazing goals. I am quite ashamed to admit that while was familar with some of these women, the majority I did not know about. I am thankful for books like these for they broaden my horizons. The illiustrations perfectly pair with the prose. While brief in length, this book packs a powerful punch. This book should be in the hands of every liitle girl but particularly more so, it should be in the hands of every little boy. Definetely would recommend this book. I absolutely love it. 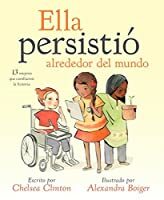 This book is written by Chelsea Clinton and features the stories of 13 girls and women, who, through varying circumstances persisted against obstacles to excel in their fields and accomplish their dreams. Il en faudrait beaucoup plus, des albums comme celui-ci! A lovely little book for children that depicts how women have undergone trials and tribulations through the years to become noticeable figures in the U.S. I liked the tone of the author, which neither sounded condescending nor academic. I'd have liked to read about women outside of the States too, but that maybe for another book. The pictures are colourful and complement the essence of the overall text adequately. They are also accompanied by inspirational quotes. I like that the book includes both women you've most likely never heard of with some of the more famous names. I like that the women are accomplished in a variety of areas. The brief entries for each of the women made me want to learn more about them. And I love that the focus of this book, and of She Persisted, is on persistence. Each of the women featured faced a variety of obstacles and did not give up on her dreams. That's a very important lesson. This is so cute and inspiring!!!! We loved this as much as the first. Wow. This is a great little book. The message is clear and often repeated: "She persisted...". This book showcases famous women from around the globe. It's a great introduction for young readers to both the women and the idea of persisting through hardship to make your dreams come true. Wonderful work that highlights ground breaking women who persisted in following their dreams despite the obstacles and have made our world a better place. We need more books like this to inspire girls and women everywhere to reach for the stars. I really like the illustrations! In her second book Chelsea Clinton introduces the reader to 13 women of the world who persisted against all odds. I love this book. Great choice of women around the world who persisted and changed things. This book encourages girls to not be scared even if their situation is not the way they want. For example, many of the women in this book faced difficulties to have a good education. Also, the book doesn't include only one area like just scientists or just artists. It includes all. There are poets, astronomers, activists, scientists, doctors, ambassadors, environmentalists, writers, sports players, and artists. So every young woman who read this book will find a role model for herself. By the w This book encourages girls to not be scared even if their situation is not the way they want. For example, many of the women in this book faced difficulties to have a good education. Also, the book doesn't include only one area like just scientists or just artists. It includes all. There are poets, astronomers, activists, scientists, doctors, ambassadors, environmentalists, writers, sports players, and artists. So every young woman who read this book will find a role model for herself. By the way, the women in the book are from all over the world, that makes the book diverse. Last but not least, the most important thing in a children's book is pictures. Children pick their books from their looks and it is good for this book because the illustrations are very good. The illustrator used calm colors and she created a peaceful mood. She drew diverse girls and the girls are very beautiful and sweet. The only thing I can criticize about this book is the information about the inspiring women are not enough. It is like a very short summary, but I guess this is because the author didn't want children to be bored and to include more people. If you are interested in this kind of books there is American women version of this book. It is also pretty good. I actually liked this a lot more than the original book. It has the typical, Malala and Curie and a couple others you are familiar with already, but, also some not so commonly talked about who have done amazing things. Just really liked this one. Such an inspiring story about women and girls who have persisted against all odds to make their contribution in the world and break down barriers for others to follow in their footsteps! Lovely illustrations add to the elegant ambiance of the book. Annoying grammatical errors (which should have been caught by editors) subtract a fifth star. I loved learning about some powerful woman I had never heard of before (along with a few that I have). I think this book will be very inspiring for young girls. that being said, I'm not a huge fan of the wording at the very end. I'm not entirely sure why, it just sounded off to me. What a lovely book to inspire children and adults alike! The mini biographies are succinct and written for a broad audience. The illustration is beautiful. 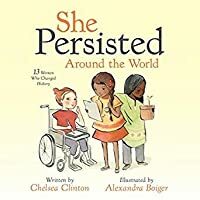 A picture book by Chelsea Clinton with a two-page spread for each of thirteen International women who have been and done remarkable things despite (usually) men telling them no. There is a good mix of diversity: ages, racial/ethnic, and geographic, but nothing stood out as LGBTQIA+ to me. Additionally, I think the content may be too challenging for the young readers who will be read the book. It is just like Clinton’s original Persisted book, but with a focus on non-American women. This book was heartwarming and inspiring. I really liked the "around the world" angle - it introduced many, many other people I'd never heard of or only read a name. I also really liked the illustrations, and that each profile had a quote. This book is filled with wonderful stories about girls and women from around the world who worked hard to achieve their dreams.